Sorry about posting almost an hour later than I intended to.....got caught up in a movie that I was watching! Thanks to everyone who entered my Giveaway; the numbers were few, however it only meant less competition! 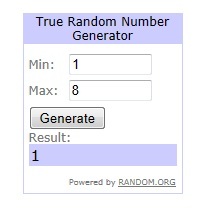 Congratulations to Nee of RoseCandle 11!! Let me know your address via email within 48 hours!!! ooohh wowww! can't believe i won:D thank you so so much Chi-Chi! i'm goint to write you an e-mail right now! :) super excited!